Some sites are utterly addictive. You return to them often, and when you do, you tend to stay there for a good while, visiting different pages, viewing interesting content. In a word, the site is engaging. But how do you measure it? How do you put a number on how engaging a site is? Figuring out how engaging a site is can be tricky. We could look at the number of page views per visit, but that number alone doesn’t really tell us much. We also need to take into consideration how often visitors come back to a site. After all, if we return frequently to a site and also view many pages when we do, it’s likely that find the site engaging. For the sake of argument, this article will measure how engaging a site is as the number of monthly page views per visitor (monthly visits per visitor * page views per visit). You could call it visitor activity level, but we prefer “engagement level”. These numbers are bound to be a bit unfair to Twitter. Many of its users rely heavily on applications to access the site and don’t necessarily spend much time on the site itself. It’s interesting that Facebook not only has a ton of users (350+ million), but the site manages to wring out so many page views from each one. This is bound to be extremely good news for Facebook’s income from advertising (see further down for a brief discussion of this). Those of you who like to dig a bit deeper may wonder how we arrived at these numbers in the first place, which is a perfectly relevant question. The following section is for you. The average number of monthly visits per visitor. To get the most out of its visitors, social network sites will usually want to maximize both of these. Facebook doesn’t have the highest number of page views per visit, but its visitors come back to the site very often and still generate a good amount of page views each time. This is why Facebook got such a high site engagement level in the first chart. Social network sites have a tendency to make us click around quite a lot more than we do on most other types of sites. This is underlined by this mini study, which shows that all of the top five sites in site engagement are what you could call “traditional” social network sites, loosely following the template set by Friendster in 2003. 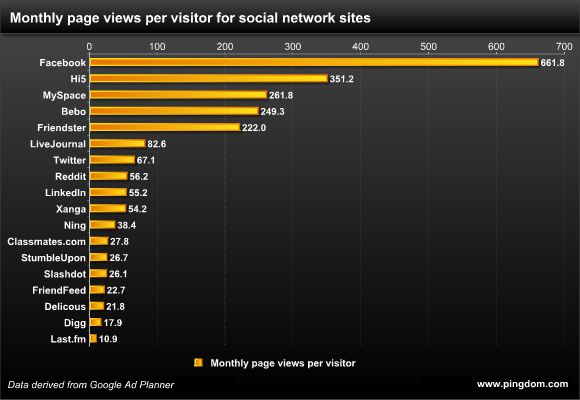 If we just look at the number of page views per visit, the most engaging social network would be… drum roll… Friendster. 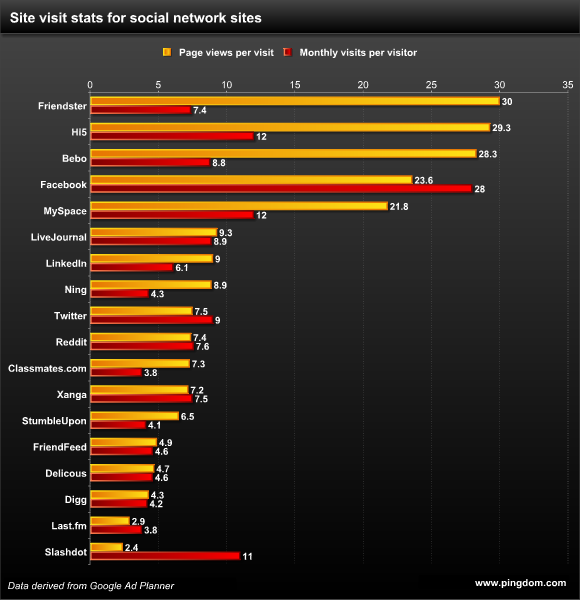 Facebook’s 28 monthly visits per visitor is more than twice that of any other site in this study. Facebook seems to successfully encourage its users to come back to the site very often. Of course, it has a little extra help from being the number one social network, but on the other hand, perhaps this is one of the reasons it got there in the first place? In this respect, Facebook has really hit a homerun. It wrings a lot more page views out of its visitors compared to the other sites. With such a huge user base, even small differences in the number of page views per visitor are bound to have a big effect on Facebook’s income, so you can assume that they are working very hard on making sure that the site is as engaging as possible. Ultimately what sites we like and use comes down to a matter of taste, but it’s always interesting to see what you can find out about the general behavior of site visitors. 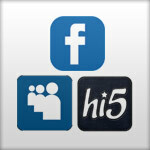 Perhaps it becomes even more relevant for social network sites, which are built around group behavior. If you’re a regular reader of this blog, you’ll know that last week we published a post about the total number of monthly page views for social network sites. For example, we revealed that Facebook has a whopping 260 billion monthly page views. This was in many ways intended as a follow-up to that post. We hope that we managed to give you some additional insight into where those massive amounts of page views come from. Note: As always when working with estimates (which Google and all other external data collection services do), there will be a margin of error in the numbers. All data in this post is from, or derived from, Google Ad Planner.